I’m about 3 1/2 months into my New Year’s Resolution of finding a healthy work-life balance. And over this time, I’ve learned a lot about my productivity levels, the best time for me to work on particular projects, what I find distracting, and my leading procrastination loopholes. Yes, it’s a slow process. And yes, I wish there was a quick fix. But as I was talking with a friend over the weekend, she helped me feel a bit better about this gradual transition. Dieters often drop the weight quickly by using the most recent dieting trend. And while their process is quite fast, they also tend to gain the weight back in a short amount of time. Those who take the process in slow incremental steps, however, not only have a healthier weight loss generally, but they also manage to keep the weight off for good. In other words, it’s diet vs. lifestyle change. When I think about this idea in terms of my own journey toward a healthy work-life balance, I see a lot of similarities. While it’s easy to want the “quick fix,” and even easier to get frustrated when I don’t find an immediate solution, it’s also important to remember that those fast changes don’t often last. Rather, it’s the slow, incremental lifestyle changes that really make the difference. So for my three-month New Year’s Resolution update, I want to share some of the most important productivity and balance lessons I’ve learned thus far. 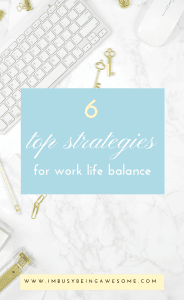 I hope you find them as useful as you work toward a healthy work-life balance, too! For the longest time, my most productive hours were in the early morning, and my afternoons were reserved for mindless tasks. Over the last several months, however, I’ve discovered that this general “rule of thumb” has shifted a bit. Yes, I am productive in the morning, but only when doing certain tasks. In the early morning, my creativity is at its peak. This means that when I try to do research, read articles, and grade papers during this time, I find myself getting easily distracted. In fact, I’ve found that I do my best blogging work between the hours of 7-9 a.m.
After that, I generally need about 30 minutes to shift gears, so I spend time answering emails. From 9:30-11:30, I’m at my peak focus for reading. And then it’s time for a lunch break. After lunch, from about 12:00-2:00, I have my writing and research hat on, followed by a few hours of course prep and grading at the end of the day. In other words, while I initially believed that early morning was the only time I could get my most demanding work done, I’ve found this simply isn’t the case. Rather, I just needed to get more specific about my productivity levels. Take some time to record when you’re most productive. Ask yourself, “Are there certain times of the day that allow me to focus on specific tasks?” If so, make note! Don’t be afraid to try something different from the “norm.” And I’m talking about different from your norm, as well as the workforce generally. If your golden hours are in the mid-afternoon – that dreaded time when most people face the afternoon slump – go with it! Do what works best for you. Do you battle the afternoon slump? If so, check out my post filled with strategies to beat those sleepy hours, and then get my free cheat sheet to power through the afternoon with maximum productivity! Time blocking has always been my favorite time management strategy. But as I’ve discovered my peak times of productivity vary for different tasks, time blocking has become an even more valuable tool for work-life balance. Similar to how I described my day above, time blocking simply means taking your day’s to-do list and breaking it into manageable chunks. And remember, leave mini brain breaks in between your tasks, as this ensures proper rest, and helps you get to everything on your list without feeling overwhelmed. If time blocking is a new strategy for you, please be sure to check out my post, the number 1 time management strategy: time blocking, where I walk you through the process from start to finish. Then, download my free time blocking template, which you can use every day as you make your plan of attack. This was a big discovery for me. While I’ve always known I’m easily distracted from people talking, the sound of the television, music with lyrics etc. I never paid much attention to how noisy my brain is all the time. When I’m working on a high demand task or something that is particularly challenging, I’m prone to distraction. I find myself thinking about – well – pretty much anything other than the task at hand. What I should have for lunch. How I should phrase an email. What size bolt I need for a table I’m putting together (the current thought running around my mind this morning). Honestly, my chatty mind just starts going and I can’t shut it up. What’s more, sometimes I don’t even realize I’m wasting time, because I’m so absorbed in those very thoughts. So what does this have to do with my sonic environment? Let me explain. I’ve discovered that in order for me to stay focused, I need to have a noise machine running. Full stop. I need that constant low-frequency whooooosh of sound to help me cancel out both the outer sonic environment, as well as the constant chatter inside my head. I now have a noise machine in both my home and work offices, and it has made a world of difference. When I have the option, however, I prefer an actual noise machine. If you’re interested, this is the one I have both at home and the office; I find the low frequency particularly soothing. I’ve found that I need a supportive desk chair and a big desk where I can spread out my papers, books, computer, planner, etc. What’s more, if I’m working on something off the computer – grading papers, editing an article, reading a book, etc. – I do much better at a table completely separate from my computer. Otherwise, it’s just too easy to get distracted by – well – anything on the internet. Finding the proper, supportive furniture will make for a much more productive day. This, in turn, helps you to finish work earlier, and ultimately head home to enjoy your night with the family. A healthy work-life balance, people: that’s what it’s all about. Over the past month, I’ve absorbed myself in the creative process. I’ve learned about the importance of taking time to create, pursuing the inspiration as it comes to you, and allowing room for imperfection and play. Essentially, I’m learning to embrace the idea: “What happens if I try this? Let’s find out!” while pushing aside the fear of failure that often lurks in the background. 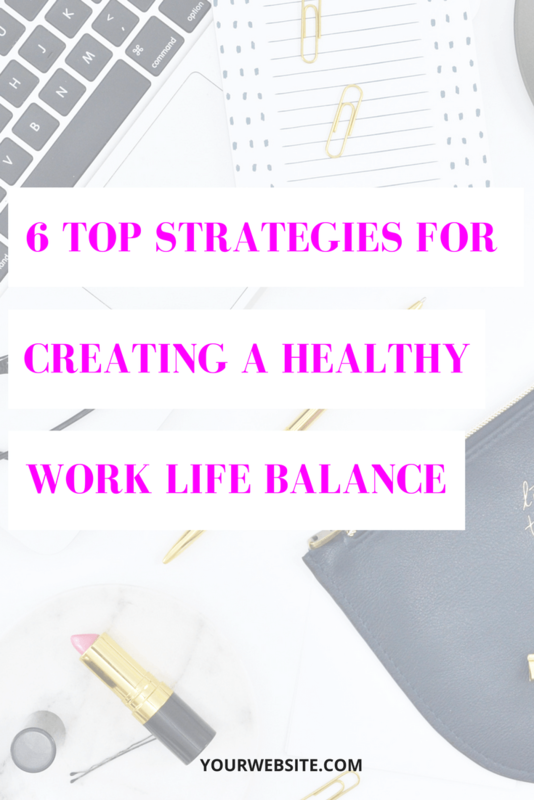 If you’re interested in learning more about the importance of creativity not only for work-life balance, but also for healthy living in general, be sure to check out my posts How to Live a Creative Life, and Break Through Your Creativity Block With These 10 Strategies. Then, download my free creativity workbook to help you get those creative juices flowing today! This last piece of advice is a bit more abstract, but it’s also perhaps the most important. As you work toward your productivity goals and strive for a healthy work-life balance, don’t give up. Here’s the deal, some days will be better than others. And speaking from personal experience, when you’re just starting out on this journey, there might be more bad days than good. 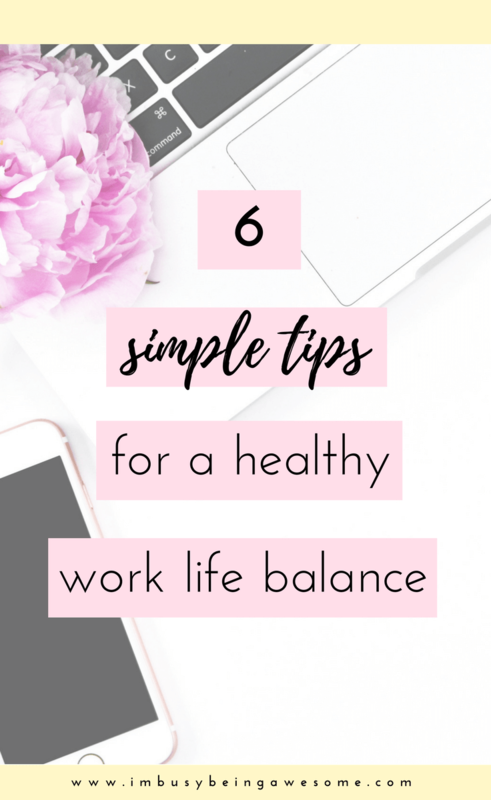 But as I better understand my peak productivity times, allow myself to stop when the workday is done, and embrace the process of creativity and expression, I find myself moving much closer to a healthy work-life balance. 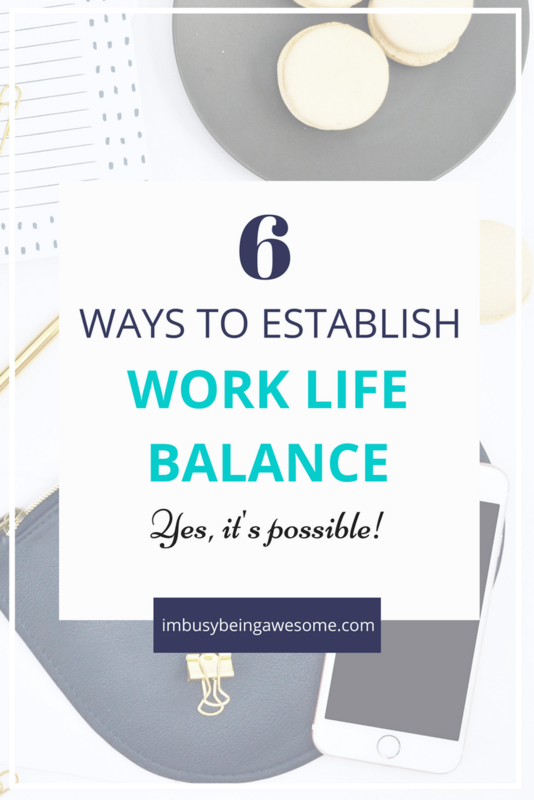 How do you practice work-life balance? Do you practice creativity on a regular basis? Did you make a New Year’s Resolution this year? How’s it going? Let me know below! My creativity and energy is definitely highest in the morning so I try to capitalize on that, too! Excellent! It’s so helpful when we can recognize our most productive times of the day. I like that comparison to weight loss – it’s so true. 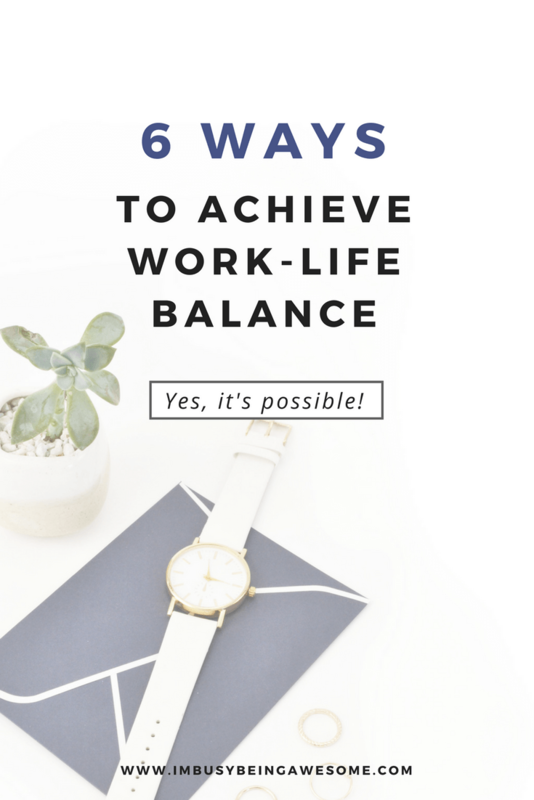 It’s the classic idea that “slow and steady wins the race.” These are all great tips, and I’m glad you’re doing well on your work/life balance. May I suggest the nonfiction book The Productivity Project? Some of it will be things you already know, but I found it interesting! I love this post! I never really thought to look into when I’m most productive at certain tasks. I always just thought I am most productive in the mornings. Going to delve into these and try to maximize my time at work so I can really maximize my family time away from work! Thanks for sharing! Yes, taking time to figure out my different productive times was a game changer for me. I hope you find it helpful, too! I love your tips about having proper furniture. While I so a lot of work here and there around the home… I still love sitting at my actual desk and real chair instead of the couch! Thanks, Brandi! It makes a big difference, doesn’t it? These were some great tips, thanks! Time blocking is so important and something I am not good at. Thank you for sharing! I love the idea of dividing your day up to when you are most productive for specific tasks! I’ve never thought of it this way and could probably maximize on my productivity by looking at what I do best and when! Thanks Raina! I hope you find it helpful 🙂 It’s been a game-changer for me! 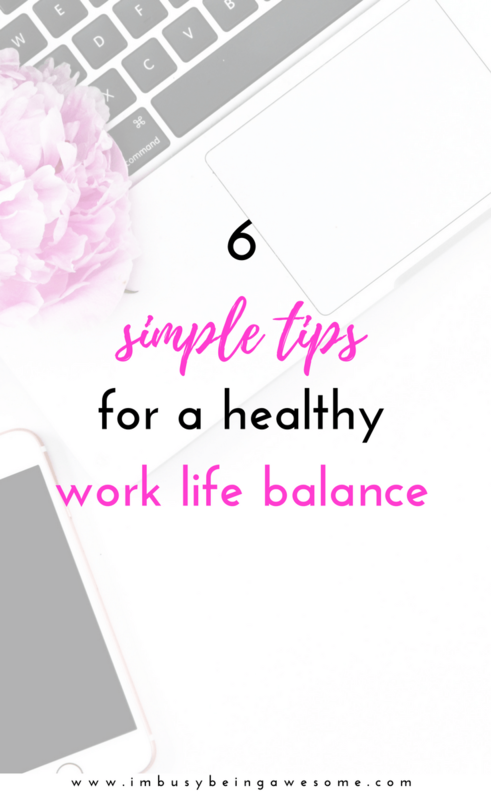 These are great tips, I definitely have troubles with a healthy work life balance. I usually take on too much and struggle to finish it or get overwhelmed and frustrated. Thanks for these ideas, they will help!! I don’t use a nosie machine, but I use a site called mynoise.net to personalize a rain noise background that helps me focus. Itoo love the weight loss analogy! It’s building habits that will get you there. This is so important, especially since I work at home and can technically work whenever. I’m going to try the time blocking out. A spot of mediation in the morning helps me to focus on my tasks for the day. You’re so right about the ‘noise’ . That’s wonderful! I love the idea of quieting our thoughts and beginning the day with a clear mind. I think you raise a really important point, Brittany. There are certain times of the day (or even certain days of the week) that just aren’t going to be productive. When we recognize that, then we can let ourselves enjoy the break and recharge, rather than feeling like we must “power through” when it’s just not happening. The noise machine is interesting. I generally play music at work, just to help block out all the distractions around me. Usually classic or jazz. I have found that works very well for me. Yeah, I love my noise machine 🙂 That’s great that you’ve found what works for you! It’s so helpful to have something block out the distractions. Yeah, it works wonders for chatty brains 🙂 I love it.